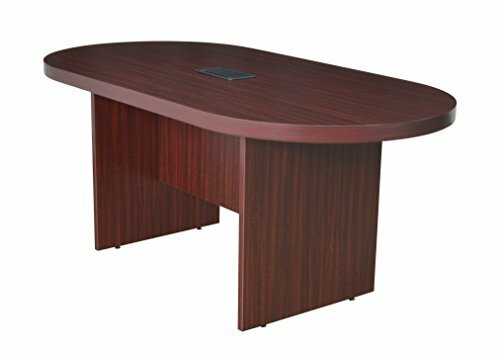 Save 1% on the Regency Legacy 71-inch Racetrack Conference Table with Power Data Grommet- Mahogany by Regency at Momiji Studios. MPN: LCTRT7135-MH. Hurry! Limited time offer. Offer valid only while supplies last. Make presentations memorable with Legacy's Conference collection! With tables that seat from two up to 24 people, there is a table for any size team. Make presentations memorable with Legacy's Conference collection! With tables that seat from two up to 24 people, there is a table for any size team. This 71-inch racetrack table comes in a classic Mahogany finish and seats 4-8 people. Adjustable glides on the bottom of the base keep the tabletop level and are easy to adjust. A Power and Data Port makes tabletop connectivity easy. The Power/Data port includes (2) USB 2.0 ports, (2) USB charging ports, (2) AC 125V 60Hz outlets, (1) front/rear ethernet port, (1) front/rear phone port and has a black cover plate for a neat, clean look. The Legacy collection is constructed of a 1-inch thick thermal fused melamine laminate with a 3-millimeter commercial grade matching PVC edge. Laminates are scratch, stain and burn resistant. Legacy casegoods are backed by a 10-year limited manufacturer's warranty. Make presentations memorable with Legacy's Conference collection!